They do it in the old-fashioned way at "Hardanger fartøyvernsenter"
Not only an interesting picture - interesting subject in its own right too. Interesting, layered perspective! Love the how the arcing lines of the boat's hull become so artistic! Great shot. I like the way the structure is so well photographed. Interesting shot! I like it! Ja, dette var både et interessant bilde og emne. Selv har vi en fembøring som er bygd på den gamle måten. Flott balanse i bildet. Her får du fram både dybde og symetri. B/W valget ditt er helt riktig til dette bildet!! Flott bilde av ein nydeleg båt! Ingenting er så flott som ein trebåt:)Bildet gjorde seg godt i s\k. Ha ei flott helg! Very interesting shot. It isn't often one can see the inside of the hull this way. It works very well in black & white, also. This does look like the hard way! So much skill involved in making boats this way - and so much skill in producing a photo like this! I like this very much. very nice! love the added rustic look with the black and white, cool framing too! What a job, and what a boat! A fine rendering on this, Rune. 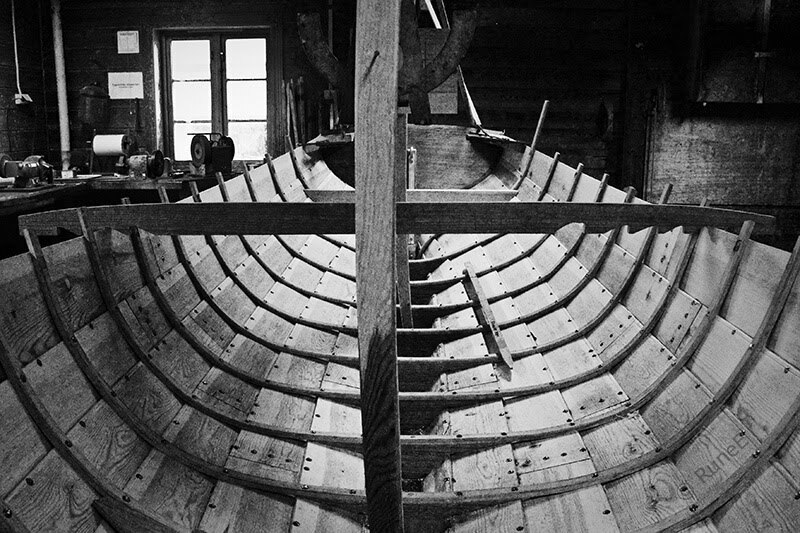 Imparts that classic charm of traditonal boatbuilding as well. The 'old fashioned way' leaves an interesting pattern of lines and dots, enhanced by the monochromatic effect. May be old fashioned but well fashioned. You've got to love a craft like that. Great image! The old ways are best; good shot. Wood always works in b&w. oh, the architecture! so they still build these Viking-style boats? I like the texture. Nice angle shot too! Have a blessed weekend! Det är väl härligt när ett fartyg byggs på det gamla sättet. Jag har sett när dom byggde Fregatten Jylland i Danmark och i Göteborg har vi ju Ostindiefararen Götheborg. Snyggt fotat. almost makes me dizzy! a great perspective & contrast! What great texture! I almost can smell the perfume of the wood, when it has just been cut and worked..
Vilket vackert och spännande foto, det har så många linjer och fina former. Passar riktigt bra i svartvitt. a perfect subject for b&w conversion. Another boat is to be launched for the Viking! Love the perspective of this image. Awesome shot! Ah, Rune, you've done it again. You elevate your subjects into something that makes the eye linger and the mind consider.